How to Make a Note Box With Close Button In Blog? For bloggers have ever asked about it. Sometimes we as a blog admin need to tell something to the visitor, like an announcement, a note, or just a congratulation when the big days. The announcements or sayings should we display with a box that attracts attention, eg using a background color and or with a color border. So visitors will not miss the announcement. Today iweblogsite will discuss how to make that fitur with a simple html code. And maybe it looks annoying note box. For that we need to provide a close button so that those who feel annoyed with the note box can easily remove it from their view. For AMP add id = 'note' and if show multiple boxes then each still have to with different ID, eg id = 'note1', id = 'note2', and so on. For color bacground same as for Non AMP. 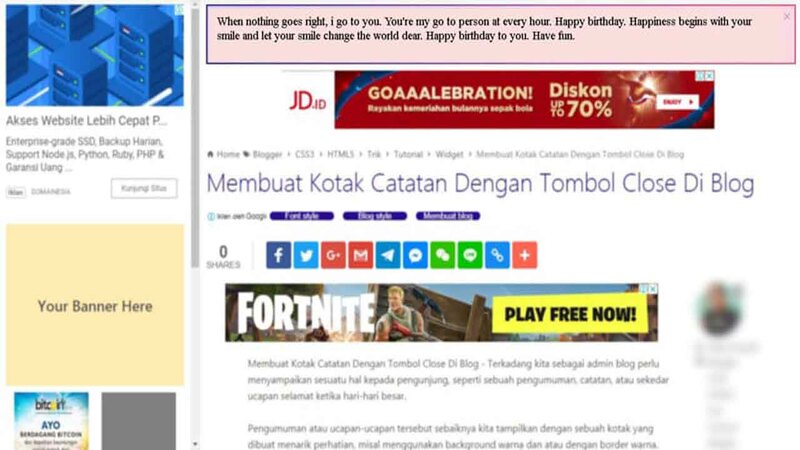 Oke that's all about How to Create Note Box With Close Button In Blog. We hope this tutorial usefull for you. Please share to your friends and do not forget to leave your comment below. Thanks for visiting.